"Chinese herbal medicine stores are a unique cultural icon," the 36-year-old explains. "They are not just a place where you come when you are sick to pick up medicine." But shops like hers are dying out -- with some 200 closing their doors every year -- even though traditional medicine remains wildly popular in Taiwan. Gu's father-in-law is the license owner but he recently suffered a stroke and she now fears the worst. "If I am forced to close shop, the biggest regret for me other than losing our livelihood, is losing our tradition," she laments. The license shortage stems from an attempt by authorities in the 1990s to better regulate the largely artisanal industry and bring traditional remedies into the purview of the professional medical community. "In Taiwan the simultaneous use of Western and Chinese medicine among the public is very prevalent and we need trained medical personnel to make sure they don't interact with harmful consequences," Chen Pin-chi, division chief of Chinese Medicine and Pharmacy at the Health and Welfare Ministry, told AFP. "We initially hoped that professionally trained Chinese medicine doctors or pharmacists might slowly take over the running of Chinese herbal stores," she added. But things did not turn out as planned. The lower pay and profits struggled to attract young doctors and pharmacists while patients kept going to the mom-and-pop dispensaries they trusted. 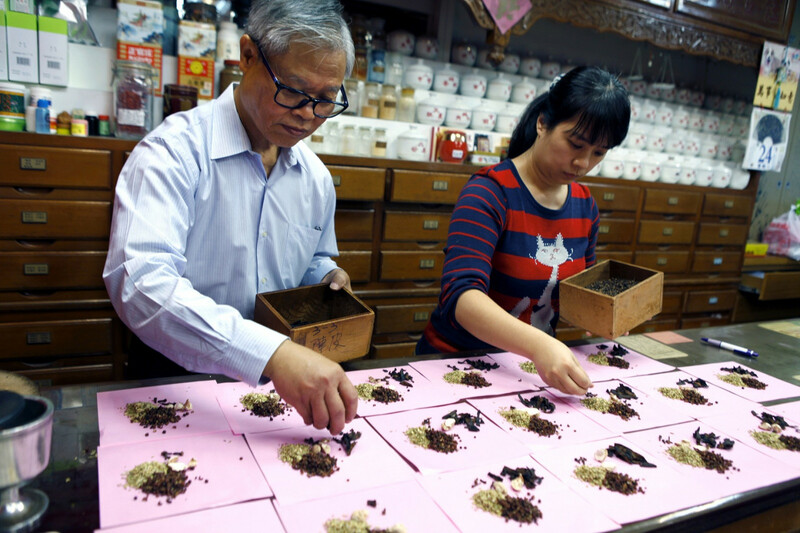 Taiwan's approach contrasts with that of the China and Hong Kong where authorities have pushed policies to boost and export traditional medicine. According to the Compendium of Materia Medica, the sixteenth-century text that is the lodestar for traditional practitioners, there are more than 1,500 different kinds of herbs used in Chinese medicine. The average store might stock between 200 and 500 herbs, roots, animal parts and minerals -- 355 of which are classified as medicine in Taiwan. Traditional medicine also permeates Taiwan's cooking -- the island's signature beef noodle soup dish usually contains at least eight herbal ingredients -- meaning ingredients are just as likely to go in the cooking pot as they are a tincture. "It was very hard work in the beginning," she said. "You need to get your hands dirty. Sorting, washing, chopping and slicing, lots of work goes into processing raw herbs and roots ready for use." she said. "And even now, I am still learning new things from my father," she added. "This is very much a profession where experience counts," said the older Lee, who entered the trade when he was 15 years old. "If the government will not issue any new licenses then the second generation cannot carry on with the shop," he lamented. The license shortage has prompted protests on the streets of Taipei and the government is in talks with industry leaders to try to find a way forward. "The Health and Welfare Ministry is well aware of the urgency of the matter and is actively trying to seek a solution," Chen Ping-chi said. "Hopefully we can come up with something soon that would allow Chinese herbal medicine shops to continue to be operated by the younger generation," she added. Gu is painfully aware the last 20 years have produced no solution and fears a change to the law may come too late for her family. "If this situation continues," she warned, "there won't be any Chinese herbal stores left in Taiwan."